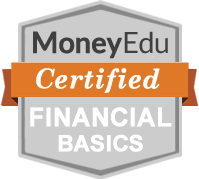 The MoneyEdu Financial Basics Certification Badge recognizes significant achievement in financial literacy education. With MoneyEdu, your credit union can bring this innovative program to local high schools and community organizations at no additional cost. Our certification program requires successful completion of Financial Basics for High School, a robust multi-course curriculum that's mapped to national financial literacy standards and covers dozens of topics required for financial success in college and beyond. Certified students earn a personalized badge and a personalized MoneyEdu certification page that's ideal an credential for college applications, employment applications, or for any other purpose. Most students earning certification spend between five and six hours studying the 45,000+ word curriculum. Many students complete the program as part of an in-the-classroom curriculum led by a high school teacher using our Classrooms platform, a classroom management tool that leverages class-specific survey and quiz responses for a true blended learning experience. In the State of North Carolina, completion of this curriculum earns a state-recognized credential. We're working to bring similar recognition to additional states. Students earning Financial Basics Certification must demonstrate mastery of the following courses. Your decisions about when to borrow, how to borrow, and how to manage debt affect more of your life than you may expect. The pros and cons of buying a home, including a comparison with renting. Einstein said "compound interest is the eighth wonder of the world." Was he right? Your choices about careers and employer benefits are some of the biggest financial decisions you'll ever make. Why college is a great investment, even though it has an increasingly high cost. What does it mean to be financially healthy? How do you measure it? Let's take a look. A look at commonly used financial services and accounts, including banks, credit unions, and alternative services. A quick introduction to site goals and resources for high school students. How to get the most for financial services while minimizing fees and protecting your personal information. Steps you can take to minimize the chances of identity theft. One in five Americans have bad credit, which is commonly defined as a credit score below 620. Understanding your rights and responsibilities when renting an apartment. As a financially capable individual, how you choose to spend money should reflect your goals, values, and priorities. MoneyEdu is a service of Decision Partners, a pioneer in online wellness education. For over a decade, we've helped over one million individuals with personalized "just in time" financial education on a broad range of topics.